November is coming to an end and in some ways it feels like December has already begun as our tree is shining bright in the living room and today is the day of the school Christmas fair. November has been fun and busy with lots of time outside whilst it isn't too wet and windy and a couple of fun days out having some one on one time with my biggest boys. My diary for December is looking incredibly hectic with fun festive plans and it begins with three parties on the 1st so we are diving straight in! 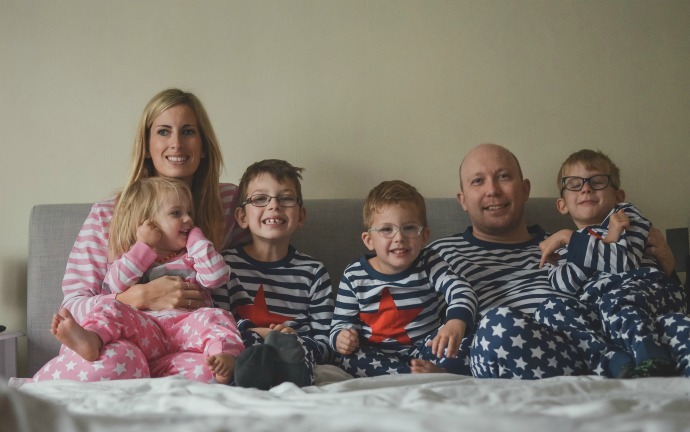 This month we were sent a pair of pjs each from the Original Factory Shop and they were perfect for taking our family photo. £2 is donated from the sale of each pair (and the kids pairs are only £5 each!). Ed has loved seeing Less than Jake in Birmingham, chocolate orange mochas, showing the kids some of his favourite childhood films and halloumi cheese. Archie has loved training to be an Avenger at the Avengers Station, watching videos of other people playing Roblox, parent art sessions at school and having his friends over for after school playdates. Finn has loved his new train set that he got got finally wearing his glasses, camping on his bedroom floor, walking Bella the dog at the weekend and the colour pink. Cora has loved the feisty pets scary toys, dresses with pockets, going back to baby gymnastics and scooting through puddles when it has rained. December, I think we are just about ready for you!